When it comes to outdoor cooking, you can make things as complicated or as simple as you want them to be. In a survival situation, it is always better to focus on simple meals which can be made quickly with minimum preparation time and clean up. It also helps to have the fewest amount of utensils or cooking implements involved as you can. Minimalist cooking is a solid philosophy which keeps your backpack light and your environmental impact low. A campfire provides many opportunities for minimalist cooking. Of course, everyone is familiar with roasting things like hotdogs and marshmallows on a stick. You can also do this with mushrooms, bell peppers, strips of beef and chicken breasts. However, there are also other ways to cook using a campfire. Instead of roasting over the open flame, you can use the campfire’s red hot coals to cook food wrapped in aluminum foil. You can cook certain items that don’t roast well in this manner, such as potatoes, as well as other different kinds of vegetables. If you have an iron pan, you can place the pan on the coals to make food such as pancakes. I know that pancakes might seem like a counterintuitive menu item given that we are talking about foods that require minimal preparation, but if you use dried pancake mix that requires you to add only water, the process is rather simple. Simply mix the water and pancake mix in a plastic bag and then poor it onto the griddle, flipping the pancakes until both sides are done. Cooking with boiling water is also quite practical. By boiling water in a pan, you can cook many different types of roots and vegetables, softening them up and making them easier to chew and digest. You can also use boiling water to cook eggs without the messy cleanup, giving you a good source of protein. Break each egg into a Ziploc bag. After sealing the bag, use your fingers to scramble the eggs. At this point, you can add any bits of meat, cheese or vegetables that you would normally put in an omelet. Seal the bag again and drive a stick through it so that you can suspend the bag in the boiling pot of water. In about 5 minutes, you will have a scrambled egg omelet, without any pans to wash, and a pot of sterilized water to do with as you see fit. You can of course also use either of these methods to cook with, or heat up canned food. A simple corned beef hash can be made from canned beef, canned corn and flecks of potato fried together in a skillet over a campfire. You can also use the skillet to heat up canned soups – although be mindful of the sodium content in those soups and what that can do to your water consumption. 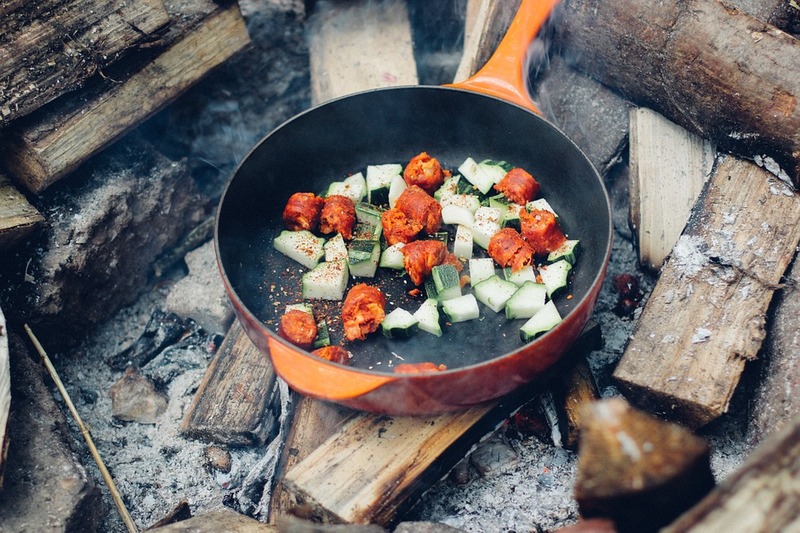 With matches, an iron skillet, a good knife and a can opener, you can make the most of your minimal supplies and create a varied diet that will keep you going on the trail.